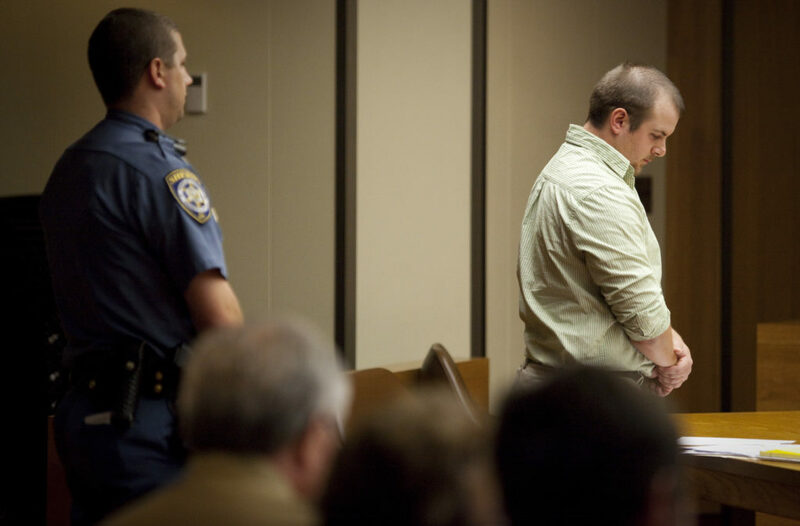 Zachary Harrison waits to be led away Friday by a Douglas County Sheriff’s officer after his sentencing in the Nov. 23, 2010, drunken-driving crash that killed Cameron Freeman. Harrison received more than six years in prison. A Douglas County judge Friday ordered a former Air Force airman and Afghanistan veteran to serve more than six years in prison for the November 2010 fatal drunken-driving crash north of Lawrence that killed Cameron Freeman, 21, of Lincoln, Neb., and injured three of his friends. Zachary Harrison, 23, and originally from Hutchinson, had pleaded no contest to involuntary manslaughter and seven other charges in June, including three counts of aggravated battery. 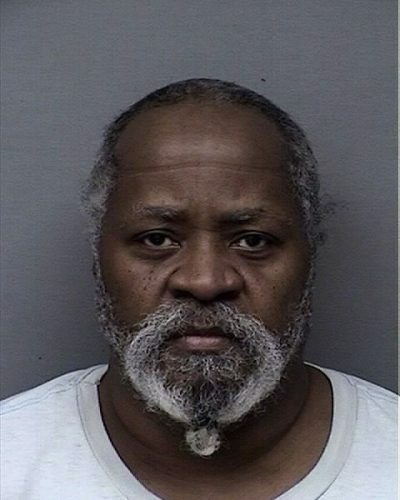 District Judge Sally Pokorny during a 90-minute sentencing hearing ordered Harrison to serve consecutive sentences in prison for Freeman’s death and the injuries to his three friends for a total of six years and nine months. “The reason for that is because there are four people involved in this case and each of those sentences means something,” Pokorny said. Harrison was an Air Force airman in Lawrence on Nov. 23 visiting his brother. During a night of drinking, he stole a newspaper carrier’s truck on the Kansas University campus and eventually ran into the back of the car Freeman was riding in on U.S. Highway 24-59. According to prosecutors, Harrison was traveling at least 78 mph when he rammed into the Mazda 626 that Freeman’s friend Casey Kettler was driving. Michael Larsen and Fernando Pages were also in the car. The friends from Nebraska had attended a concert in Lawrence and were headed back to Lincoln. Pages was in a coma after the accident, but he spoke in court Friday. 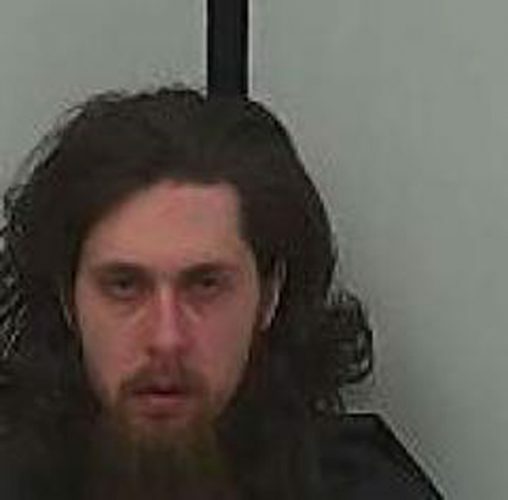 Harrison’s defense attorney, Jason Billam, had asked Pokorny to give Harrison probation or concurrent sentences — or about three years in prison — saying he had taken immediate responsibility for the crash, had no past criminal history and could benefit society more out of prison because he had undergone treatment for alcohol. According to prosecutors, Harrison’s blood-alcohol content after the crash was 0.183, which is more than twice the legal limit to drive in Kansas. Billam said that ironically earlier that night Harrison did make a good choice and got a ride to a bar where he drank before he stole the vehicle. Harrison wanted to plead guilty almost from day one in the case, but the defense wanted to wait for test results to see if he had any drugs or anything else in his system, but the tests were negative. Billam said that after he was arrested, Harrison was discharged from the Air Force. “What this illustrates is that with your best intentions, your decisions with alcohol can change your life forever in a matter of hours,” Billam said. Harrison in a brief statement said he took full responsibility for everything that happened. “I’m truly sorry to everyone that I’ve hurt including my family and the victims that were involved,” he said. Harrison, who had been free on bond, was taken into custody after the hearing. “One of the things that we really hope to do is change that culture that is so acceptable right now, to drink and drive, and reverse that to where it is totally, totally unacceptable,” Shelley Freeman said. Several members of Cameron Freeman’s family and friends spoke during the sentencing, mostly about what type of person Freeman was, his music, his writing and interest in philosophy. His mother said that in grade school Cameron even had an award-winning science experiment about curing AIDS. A projector displayed a photo of Freeman on a screen in the front of the courtroom, but during a PowerPoint presentation by Shelley Freeman about her son’s life, she included a photo of the barely recognizable remains of the car. She said she’d heard Harrison did not remember the crash. “At least this gives the context to who Cameron was and what it was that happened and that it was a human being,” she said. Shelley Freeman also talked about how when she was home in Lincoln around 4 a.m. the morning of the crash — before she even knew there was a crash — she felt a deep sense of pain and despair about a memory from her childhood. She believed it occurred during the exact moments her son’s life slipped away as first responders and medics tried to help him. “I did not sleep while you were dying, my son,” Shelley Freeman read in court from a poem she wrote, which also caused Pokorny to pat her eyes with a tissue. “I’m imposing this sentence because the result was really bad,” Pokorny said. Paul Freeman said his family wanted appropriate punishment for Harrison because the crash was so difficult on the victims. While they indicated the sentence was just, Freeman’s parents also showed compassion to Harrison. They wore buttons that included the word “compassion” on them with the website cameroneffect.com, a movement in which Freeman’s family and friends urge people to perform seven acts of kindness or thoughts of compassion in honor of Cameron Freeman. They also plan to have a memorial in Lincoln on the anniversary of the crash, Nov. 23, 2011. The original idea for the movement came after they saw Internet comments posted on a Journal-World story about the initial crash. Paul Freeman said the comments were “vicious” toward Harrison. Shelley Freeman said she chose to focus on her love for her son in those moments instead and wanted to encourage others.